| Blog | Welding | Are you aware of the submerged arc welding process? Are you aware of the submerged arc welding process? 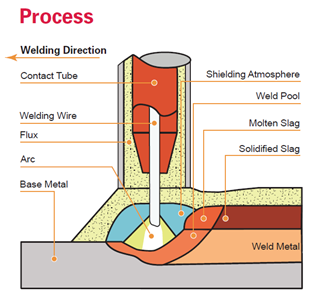 The submerged arc welding process (SAW) is used to fuse metal pieces by producing an electric arc between an electrode wire with continuous wire feed and a base metal. The electric arc is produced beneath a layer of granular flux which is laid down on the joint to be welded. The flux protects the fusion bath against the oxidizing ambient atmosphere. It also eliminates the welding splatters and the ultraviolet ray emissions. Submerged arc welding is generally used for the fabrication of large pieces. This is a reliable and robust welding process, which allows us to achieve very good quality welds with high-level productivity. Alternating current (AC): allows a compromise between the DC (+) and the DC (-). We obtain a better weld penetration than the DC (-) and a superior weld deposit rate than the DC (+). We find different variables within the submerged arc welding process. SAW tandem which uses two welding wires with each having their own welding arc. Generally, the first arc has a continuous positive electrode current DC (+) to achieve a good weld penetration. The second arc has an alternating current AC which optimises the weld deposit rate without worrying about the problems related to magnetic blowing. Submerged arc welding has certain limitations; it can only be used in a flat and horizontal position. It could be used as a semi-automatic process, but it is generally operated as a fully-mechanized or automatic process to weld linear assemblies. This is the ideal welding process for bridge superstructure manufacturing and largescale structural steel.